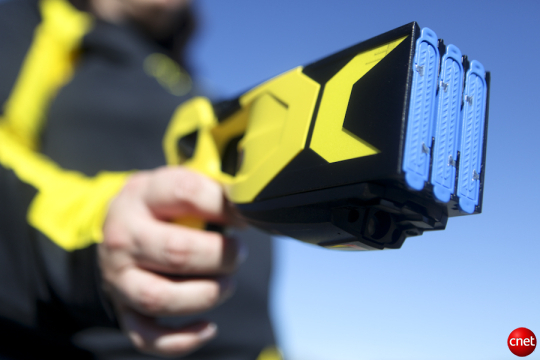 A police officer used a Taser stun gun to subdue a 10-year-old girl in her own home. The officer had been called to the girl’s home in Ozark, Arkansas, by her mother because she was behaving in an unruly manner and refusing to take a shower. In a report on the incident the officer, Dustin Bradshaw, said the mother gave him permission to use the Taser. When he arrived, the girl was curled up on the floor, screaming, and resisting as her mother tried to get her in the shower before bed. “Her mother told me to take her if I needed to,” the officer wrote. The child was “violently kicking and verbally combative” when he tried to take her into custody and she kicked him in the groin. He then delivered “a very brief drive stun to her back,” the report said. The girl’s father, Anthony Medlock, who is divorced from her mother, said the girl showed signs of emotional problems but did not deserve to be “treated like an animal”. He said: “Ten years old and they shot electricity through her body, and I want to know how the heck in God’s green earth can they get away with this. “If you can’t pick the kid up and take her to your car, handcuff her, then I don’t think you need to be an officer. She doesn’t deserve to be treated like a dog. She’s not a tiger.” Local Mayor Vernon McDaniel said the FBI should investigate. He said: “People here feel like that he made a mistake in using a Taser, and maybe he did, but we will not know until we get an impartial investigation.” The local Police Chief Jim Noggle said no disciplinary action was taken against Bradshaw. “We didn’t use the Taser to punish the child, just to bring the child under control so she wouldn’t hurt herself or somebody else,” he said. He said if the officer tried to forcefully put the girl in handcuffs, he could have accidentally broken her arm or leg. Mr Noggle said the girl will face disorderly conduct charges as a juvenile.